Not long ago, I considered the games that I loved replaying the most, with Fire Emblem Awakening being at the top. While I liked Fire Emblem Fates (specifically Conquest) at the time of its release, it hasn’t aged well for me over time. Not only have I not completed Birthright or even started Revelations, I don’t even have an interest in replaying Conquest (gasp! Not even Owain can make me replay it again). It got me thinking about Echoes, and if this game would have more replay value for me. As a remake, would Echoes suffer from borrowing from its original and not being enough like the new games? Or would it forge its own path as a unique entry in the series? I’ve burned through the first twenty hours of the game, and I really enjoy it so far. Here are my thoughts, categorized into sections for easy reading (and writing!). The gameplay, while quintessentially Fire Emblem, does take some radical departures from what we often associate with the series. The weapon triangle, weapon durability, and axe wielding classes are completely removed from the game, while magic and archer classes see a considerable upgrade in utility and range. Within towns, harbors, and castles, the game takes on a more visual novel, Phoenix Wright-esque style, where the player can examine their surroundings and pick up items. In addition, the game also features shrines where the players can do dungeoneering of sorts for extra battles and equipment. At first I thought this mash-up of gameplay styles would clash, but they all work very well together to make this Fire Emblem game stand out among the rest. The game does not feature marriage or children mechanics, and I’ll be the first to admit I was disappointed by this. But then I remembered that Fates did a very poor job of implementing the children characters in a way that made any amount of sense at all, and I was suddenly very much fine with not seeing the mechanic return. What’s even more impressive is that Echoes still makes me care about developing the Supports between characters even without the added incentives. However, I am disappointed by the few number of Support conversations characters can have—many, from what I have seen, only have Supports with one, maybe two characters, and that’s a shame that the number has dipped considerably compared to Awakening and Fates. On the flip side, the writing of these Supports is a bit stronger than in Fates (specifically the training oriented conversations in Birthright), featuring an array of character-centric topics for the characters to discuss. It doesn’t feel like the writers are grasping straws writing conversations for the characters to have since they’re more focused around their feelings and even familial relationships as well. A story of classic political intrigue and fantasy, Fire Emblem Echoes’ story is pretty straightforward at times, but also very enjoyable to experience as well. I suppose it’s been a little “predictable”, but honestly, the game isn’t trying to be mysterious and veil too much from the audience. The game seems to be aware that its audience will likely to catch on to some key points in the narrative, and if anything, it adds to the experience because the players can witness the character’s reactions. I will say that between Alm and Celica’s stories, I prefer the story being told in Celica’s campaign. The story is more interesting and nuanced, nothing against Alm’s story of rising up of course, but her story is less straightforward and I like that about it. Also, being able to switch between the two armies simultaneously is quite fun as well, allowing the players to pick and choose which side they’d like to invest more time in and whatnot. Most of the cast of characters is solid in both Alm and Celica’s stories, but I find that I overall enjoy the cast in Celica’s army more. They feel more dynamic and interesting rather than many of the one-note characters in Alm’s story (looking at you, Faye). The character designs are excellent though—when I first heard that the main artist of Awakening and Fates, Yusuke Kozaki, was being replaced I was disappointed. However, new artist Hidari’s style is a welcome addition to the series, with his soft drawings and colors. All of the character designs are fresh and diverse, and considering the original designs in Gaiden, that’s really impressive. Echoes benefits from using the same 3D engine as seen in Awakening and Fates. 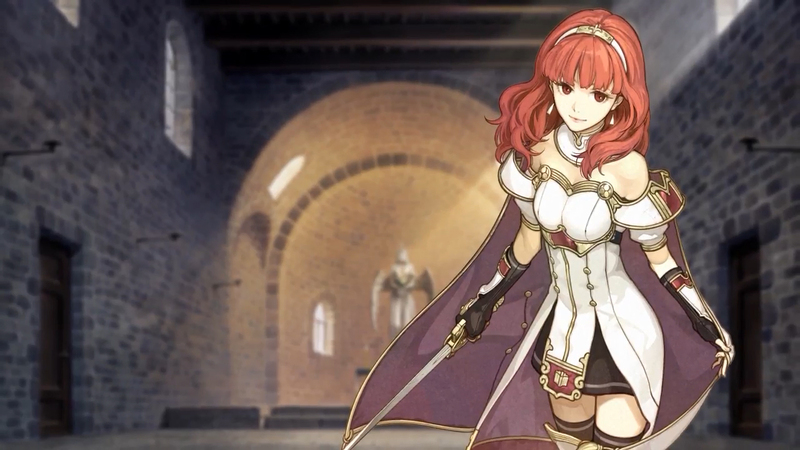 The animated cutscenes look pretty good, although I’m not sure they flow as well as the cutscenes did in Awakening. The characters sometimes seem to move in rather jilted, unnatural ways. I’m not sure if the same animation studio was in charge, but overall, it works well. I really enjoy the music in Echoes. At first, I thought it was fine, dare I say lackluster, but then came across some of the later battle map tracks and love them (although I didn’t know Mila’s Divine Protection was originally from Gaiden—that’s awesome that Super Smash Bros Brawl did a track with that song). I’m not sure how much of the music is new or re-orchestrated from Gaiden, but the soundtrack is really solid. Here is among one of my favorite tracks in the game so far. I didn’t love it at first, but it really grew on me during a really intense, epic battle. I really appreciate the differences in Echoes. Rather than trying to recapture the magic of Awakening like Fates did, Echoes carves its own path as a unique entry and remake in the series, and I would welcome more additions like it in the future. I can’t wait to finish the story and see where it goes. Yeah, he definitely does get some cool characters later on! Yeah I miss the marriages in the sense that I’d like to replay Awakening once I beat this one, but on its own I think Echoes is solid without it, like I don’t miss it in-game since Fates was a disaster with it…Hah hah, not that I hate Fates, just for some reason, the more time goes by, the more I end up disliking it. It’s weird.